The Wall Street Journal reported awhile back that the Syrian government had reversed a ban on women teachers wearing Islamic face coverings in the classroom. The concession to Western-backed Islamist protestors was instructive, since the secular socialist Assad government is clearly in the crosshairs of City of London bankers attempting to redraw the political map of the Middle East. As in Libya and Afghanistan, the banksters are counting on fundamentalists to carry out their counter-revolutionary agenda. Though Western intelligence had earlier cavorted with Islamists in attacking nationalist movements in Iraq, Indonesia and Iran; it was in Afghanistan where they unleashed the full force of their young Frankensteins. In April 1978, Daoud was killed in a popular revolution led by socialist leader Nor Mohammed Taraki, who became President and embarked on an ambitious land reform program to help poor Afghan sharecroppers, who were traditionally forced to work land owned by the king and his cronies. Taraki built schools for women who were banned from education under the monarchy. He opened Afghan universities to the poor and introduced free health care. When counter-revolutionary bandits began to burn down universities and girl’s schools, many Afghan’s saw the hand of the CIA. As the campaign of sabotage intensified, Kabul revolutionaries called on Soviet leader Leonid Brezynev to send troops to repel the bandits. Brezynev refused. Taraki appointed Tabizullah Amin as Cabinet Minister in charge of land reform. Amin, who Soviet KGB Chief Yuri Andropov came to believe was a CIA deep cover agent provocateur, launched a brutal campaign of terror against political opponents. This turned world opinion against the Tariki government. In 1979 pro-Taraki militants, convinced of a CIA destabilization plot, assassinated CIA Kabul Chief of Station Spike Dubbs. Indeed, in April 1979, a full seven months before the much-ballyhooed Soviet “invasion” of Afghanistan occurred, US officials met with Afghan warlords bent on overthrowing Taraki. Taraki appointed Tabizullah Amin as Cabinet Minister in charge of land reform. Amin, who Soviet KGB Chief Yuri Andropov came to believe was a CIA deep cover agent provocateur, launched a brutal campaign of terror against political opponents. This turned world opinion against the Tariki government. Andropov believes the CIA had Amin infiltrate the Kabul government intent on discrediting the revolutionaries. In December 1979 Soviet tanks rolled across thePanshir Valley, while KGB operatives stormed the Royal Palace in Kabul. They assassinated Tabizullah Amin and installed Babrak Karmal as the new leader of Afghanistan. 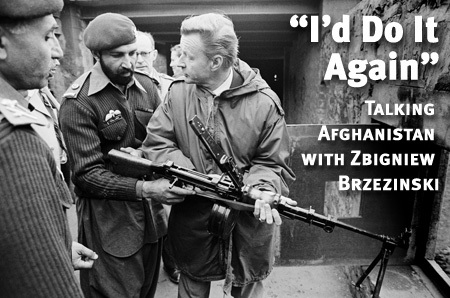 Brzezinski now had the justification he’d been looking for to begin overtly arming counter-revolutionaries in Afghanistan. CIA agents streamed into Peshawar in Pakistan’s Northwest Frontier Province. The city lay at the foot of Khyber Pass, the gateway to Afghanistan. Tens of thousands of Afghan refugees had flooded into Peshawar to escape the looming war. With help from the Pakistani Inter-Service Intelligence (ISI), the CIA scoured the refugee camps looking for modern-day Islamic fundamentalist Assassins who were prepared to intensify the guerrilla war on Kabul’s socialist government and now, to repel the Soviets from Afghanistan. The Company found what it needed in Hezbi-i Isbmi, a force of feudal-minded Islamist fighters assembled and trained by the Pakistani military with CIA oversight. Their leader was Gulbuddin Hekmatyar, a fanatic who in the early 1970’s had ordered his followers to throw acid into the faces of Afghan women who refused to wear their burkhas. In 1972 Hezbi-i Isbmimurdered hundreds of left-wing students in Afghanistan then fled to Peshawar, where they escaped prosecution under the protection of the US-allied Pakistan military government. The group was feared and despised by Afghans and Pakistanis alike, who viewed them as a terrorist organization. Pakistan became the third largest recipient of US military aid in the world, behind only Israel and Egypt. Much of that aid was going to arm the mujahadeen who launched raids into Afghanistan, seizing large chunks of real estate. A pattern emerged. During that time, the CIA Station in Islamabad – Pakistan’s capital – became the largest spook den in the world. Golden Crescent heroin output surpassed that of the Golden Triangle just as the CIA began its biggest operation since Vietnam. While Hekmatyar’s troops planted poppies, mujahadeen leader Sayed Ahmed Gailani was supplying the Turkish Gray Wolves syndicate with Pathan opium. The Gray Wolves’ Iranian supply had dried up when their good friend the Shah was deposed and Iranian revolutionaries cracked down on the country’s heroin epidemic. Gailani was a wealthy Afghan aristocrat with ties to former King Zaher Shah. He owned the Peugeot dealership in Kabul and his drug smuggling was underwritten by the Saudis. A 1989 State Department report admitted that Afghanistan had become the world’s leading source of heroin. Gulbuddin Hekmatyar followed squarely in the footsteps of Vang Pao, Phoumi Nosavan and Khun Sa – the CIA heroin lords of the Golden Triangle. Soon Hekmatyar was recognized as the world’s heroin kingpin. Alfred McCoy, in his excellent book, The Politics of Heroin in Southeast Asia, first exposed the CIA’s role in facilitating the guns-for-drugs quid pro quo. He terms the CIA approach “radical pragmatism”. This same approach would seem to belie the CIA’s penchant for backing Islamic extremists. In 1978 Lieutenant General Fazle Haq was appointed governor of Northwest Frontier Province where Peshawar became an arms supermarket for themujahadeen and home to hundreds of heroin refineries. Haq was one of the largest depositors at the CIA’s Bank of Credit & Commerce International (BCCI). He was President Zia’s closest confidant and a good friend of Zia’s son, who ran the BCCI Karachi branch. In September 1985, the Pakistan Herald reported that military trucks belonging to the National Logistics Cell of the Pakistan Army were being used to transport arms from the Port of Karachi to Peshawar on behalf of the CIA, and that those same trucks were returning to Karachi sealed by the Pakistani military and loaded with heroin. The practice, according to the Herald, had been going on since 1981, just as Hekmatyar’s forces began planting poppies. Two high-ranking Pakistani military officers were caught with 220 kilos of heroin, but were never prosecuted. The US had seventeen DEA agents stationed in Pakistan. During their tenure they made zero arrests. There was evidence that President Zia himself was involved in the heroin trade. In 1984 a Pakistani national named Hamid Hashain was caught smuggling heroin into Norway. During a routine search of Hashain, customs officials found original copies of President Zia’s personal bank statements. The incident caused a major scandal in Pakistan, where allegations of Zia’s corruption grew louder. The US increasingly saw him as a liability. In 1988 Zia’s helicopter went down in a ball of fire. Both he and US Ambassador to Pakistan Arnold Raphael were killed. The crash bore an eerie resemblance to the one that killed Panama’s President Omar Torrijos in 1981, which even General Noriega, who rose to power because of Torrijos’ death, later claimed was a CIA assassination. The US blamed the Soviets and US Air Force officials cordoned off the wreckage, barring Pakistani authorities from investigating the crash. Reagan offered his condolences, citing Zia as, “a strong supporter of anti-narcotics activities in Pakistan”. It is no coincidence that virtually all Arab nations that the West considers allies embrace Islamic fundamentalism, a repressive belief system which is quite congruent with global monopoly capitalism. Both are based on a return to rule byfeudalistic monarchyand a diminished role for government and thus democracy. Most US Arab enemies embrace secular socialism, which aims to stop the exploitation of oil resources by the Four Horsemenand their Rockefeller/Rothschild owners. Great Arab leaders including the Egyptian Nasser, the Algerian Boumedienne, the Libyan Qaddafi, the Syrian Assad and the Iraqi al-Bakr support(ed) a secular socialism (though Qaddafi proclaims himself precisely to be anarcho-syndicalist), which poses a very real threat to the neo-liberal globalization agenda. Interventions in Libya and Syria follow the same counter-revolutionary template employed by the City of London banksters in Afghanistan. Washington’s Secret War Against Afghanistan. Philip Bonosky. International Publishers. New York. 1984.